Located at the heart of campus, Bowman-Carter is the oldest residence hall at Cornell and home to approximately 110 women. Bowman-Carter Hall stands out on campus due to its distinctive architecture and decor. This building’s residents have the good fortune of having a "formal lounge" complete with a chandelier and antique reproduction furnishings. This area of the building is used by many groups for their special events, and thus is often a center of activity on-campus. Bowman-Carter residents have an appreciation for the long history of this building, as well as its recently refurbished common areas. 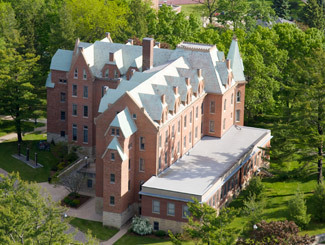 Bowman-Carter Hall is and has traditionally been a residence hall for women. It was named originally in honor of Cornell's founder, George Bowman, who had raised part of the cost of the new building. In 1989, as a result of a generous gift from Archie Carter and his wife, Marie, extensive renovations were begun, including the erection of the south and west stair towers, completed in 1990. In 1934, the fan-shaped sun parlor on the east side was replaced by a rectangular sun parlor, which in 1936 was extended southward to enlarge the dining hall to accommodate men from the newly opened Merner dormitory. The Second World War brought the Naval Flight Preparatory School to Cornell's campus and, for the only time in the building's history, men lived there (January 1943 - October 1944).